We are delighted to tell you that we have setup our social media accounts. That is: Facebook, Twitter and Linkedin. We have received a lot of requests from our visitors to have some sort of “new article notification”. Our goal here is not to generate “likes” but to give you a simple way of knowing that new article is out. Let us know what you think. And of course, you can simply insert your email address in the form on the right and click Subscribe. We will send you a basic email notification that our new article is live! Thank you for your help and constructive feedback. We know for a fact that our service helps hounders (if not thousands) visitors get their dream jobs! Read, share and make it happen. 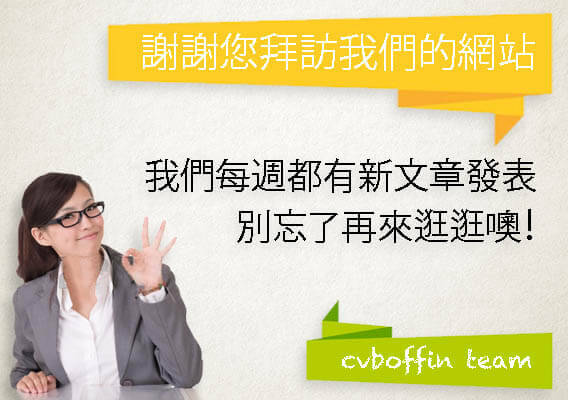 cvBoffin is on social! was last updated 六月 10th, 2016 by Daisy B.
I am from USA with Bachelor degree in IT and Master degree in HR. I am active recruitment consultant in Sales and Marketing industry. I have practical skills and knowledge of recruitment, staffing, commissioning, training and development within the public and private sectors.